using our safe, eco-friendly natural floor cleaning formulas! Most homes today have a combination of floor coverings, such as ceramic tile, marble, vinyl, or wood (either natural or laminate), and each one requires special care. However, the best advice is universal for all surfaces! Use small rugs or mats at entry doorways to trap dirt and particles that can scratch the surface of your floors. Make sure to sweep, vacuum or use a dust mop before you wet the floor. Dissolve the borax in warm water in a large plastic bucket, and then combine the rest of the ingredients. Use with a microfiber or sponge mop. This great formula will help remove dirt and deodorize. If you don’t have borax, the formula will also work well without it. Add your favorite essential oil for fragrance. Try pine or citrus for a clean, fresh smell. Add lavender or tea tree oil for a natural antibacterial boost. This is a great natural floor cleaning formula for either real wood or laminate wood floors. The tannins in the tea will enhance the natural shine of your floor. Use only a damp (or almost dry) mop! 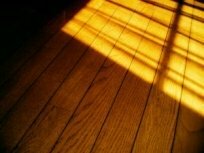 It’s important to remember not to wet your wood floors too much as the wood could swell and warp. Make sure not to saturate your mop! Note: A vinegar solution is not a good choice for wood floors because the acid content will dull your floor’s shine over time. If you save your wood floor spray, make sure to label and store this mixture as carefully as you would any other cleaning product. Although it is made from safe ingredients, it should be treated with caution. Extreme caution must be used when handling concentrated essential oils. Always test your mixture on a small, hidden area of your floors to be certain there won’t be any damage or discoloration. Return from Natural Floor Cleaning Basics to our Home page.